The preliminary round of the 2019 IIHF Women’s World Championship is officially in the books! With the tournament’s new 10-team format this year, all five teams from Group A and the top three teams from Group B move on to the quarterfinals, with no teams receiving automatic byes to the semis. The United States has been incredibly dominant in the tournament, going undefeated through the preliminary round for the fourth consecutive year to take the top seed in Group A. With an impressive 10-0 win over Russia on Tuesday, Team USA finished the preliminary round outscoring its opponents, 27-4. Canada sealed its second-place finish in Group A with a 6-1 win over Finland on Tuesday. Canada also breezed through group play, with its only blemish coming in a 3-2 loss to the United States. The Canadians allowed just two goals in their three wins. In Group B, Japan pulled off a major upset on Tuesday, stunning Sweden to finish third in the group and relegate Sweden, traditionally one of the world’s powerhouses in women’s hockey. Meanwhile, the Czech Republic, featuring NWHL stars Denisa Krizova and Katerina Mrázová, took a 2-0 win over Germany on Tuesday to finish the preliminary round undefeated and atop Group B.
Kendall Coyne Schofield (USA): The Team USA captain and Minnesota Whitecap has put on a show, tying for the lead among all skaters in the preliminary round with seven points (4-3-7). She had a pair of goals in the United States’ 10-0 win on Tuesday. 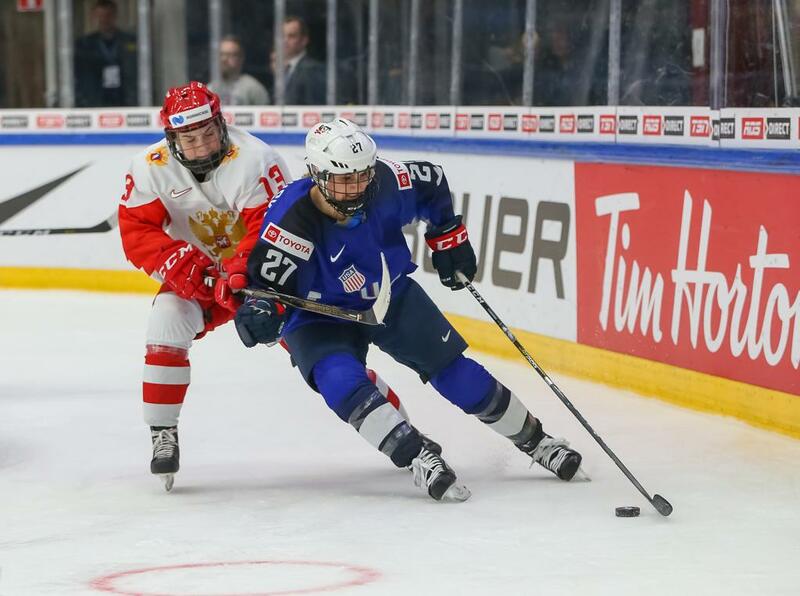 Loren Gabel (Canada): After capping an incredible NCAA career by winning the Patty Kazmaier Memorial Award, the eighth overall pick in the 2018 NWHL Draft by the Buffalo Beauts showed she belongs on Canada’s senior national team. 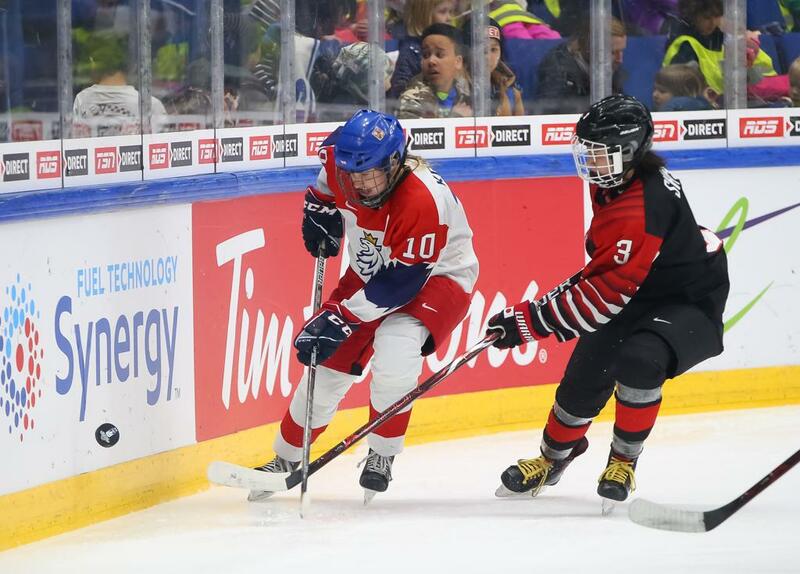 She finished with three goals and an assist, scoring in her Worlds debut before posting a three-point outing in Canada’s 6-1 win over Finland on Tuesday. Annie Pankowski (USA): After being left off the United States Olympic roster in 2018, Pankowski returned to Wisconsin and won a national championship with the Badgers. The first overall pick in the 2018 NWHL Draft, Pankowski made a noticeable impact in the preliminary round. Her ability to create offense for the U.S. was apparent even beyond her two goals and three assists. Brianne Jenner (Canada): Seeing Jenner’s name on the scoresheet is no anomaly for Team Canada. A mainstay on the national team, Jenner continued to be steadily involved in Canada’s stellar offense, finishing the preliminary round with two goals and four assists. Denisa Krizova (Czech Republic): The Boston Pride forward had a strong preliminary round as the Czech Republic controlled Group B. She finished the group stage tied for second on the team with three points on two goals and an assist (with Connecticut Whale forward Katerina Mrázová adding a goal and two assists), scoring in wins over Japan and Sweden.